3:00 AM – Officers responded to Best Western Plus to assist an individual who had been locked out of his room. The door was unlocked and officers left the scene without further incident. 2:48 PM – Officers responded to Lytle Elementary School to assist Lytle Vol. Fire Dept. with a fire alarm. School advised they are having problems with the alarm system. The alarm company will be contacted. 3:06 PM – Officers responded to HEB Plus to unlock a vehicle. 5:07 PM – Officers responded to Tots to Teens to unlock a vehicle. 5:53 PM – Officer responded to 19600 Blk. of Bruce St. for a report of a harassment. Complainant was advised to contact the police if the harassment continued after subject was advised to stop. 6:43 PM – Officer responded to Main St. for a report of a subject that fled from an assault in Bexar Co. and was in the area. Upon arrival, officer was advised that the subject was on FM 2790 E out of city limits. 8:29 AM – Officer responded to White Cap Dr. at Lake View Dr. for a report of a suspicious vehicle. Officer checked the area, unable to locate. 8:30 AM – Officer provided fingerprinting for employment purposes. 8:45 AM – Officer responded to HEB C-Store to unlock a vehicle. 10:00 AM – Officer responded to 100 Blk. of Luckey Rd. to assist Atascosa Co. with a verbal disturbance. 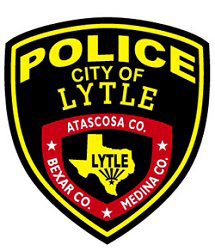 10:27 AM – Officer responded to Lytle State Bank for a hold up alarm. Turned out to be a false alarm. 10:45 AM – Officer responded to Bill Miller BBQ for a report of a suspicious vehicle in the parking lot. 10:55 PM – Officer responded to Lytle United Methodist Church for a report of a vehicle parked in the corner of the parking lot that allegedly obstructs the view at the intersection. 12:09 PM – Complainant reported an unattended child left in a vehicle. 1:45 PM – Officer responded to the 100 Blk. of Luckey Rd. to assist Atascosa Co. Deputy with a domestic disturbance. 3:10 PM – Officer responded to AutoZone for a report of a shoplifter who ran out of the store carrying AutoZone brand radiator coolant. 4:02 PM – Officer responded to 15000 Blk. of Main St. to assist motorist with directions to the local dentist office. 6:05 PM – Officer responded to 16300 Blk. of FM 463 to assist Medina Co. with livestock that came into the city limits. They were rounded up and returned to their property. 8:11 PM – Officer responded to FM 3175 and assisted Lytle Vol. Fire Dept. with a possible out of control fire. All was okay. 7:39 AM – Officer responded to 1800 Blk. of CR 6710 for a report of an alarm. Officer found an open back door and cleared the house. No signs of criminal activity found. Officer made contact with the owner and made him aware of the situation. Officer was able to lock the door. 1:44 PM – Officer responded to 14900 Blk. of Adams St. for a report of an alarm. Officer found an open front door and cleared the house. No signs of criminal activity found. The father of the homeowner arrived and said he would secure the house. 2:22 PM – Officer responded to 14600 Blk. of Main St. for a report of a verbal disturbance between a male and a female driver in two separate vehicles. Officer was unable to locate. 5:05 PM – Officer responded to 19000 Blk. of N. Somerset St. for a report of a civil matter – child custody. 7:00 PM – Officer responded to 19800 Blk. of Bruce St. to assist Atascosa EMS with a patient. 6:38 AM – Officer responded to McDonald’s for a report of a panic alarm. Officer made contact with the manager who knew nothing about an activated alarm and stated no employee activated an alarm. 8:14 AM – Officer responded to Blk. of Main St. for a report of a reckless driver. Officer searched the area, unable to locate. 9:20 AM – Officer responded to 15000 Blk. of Main St. for a report of debris on the roadway. Officer arrived and cleared the area. 9:45 AM – Officer responded to HEB Plus for a report of a beer run. A Hispanic male fled with two cases of Budweiser valued at $40. 12:41 PM – Officer responded to IH 35 S for a report of a reckless driver. Officer searched the area, unable to locate. 3:08 PM – Officer responded to HEB Plus for a report of a suspicious male wearing just jeans jumping from the cart returns and pretending to fall on the pavement. Officer spoke to several employees and checked the surrounding businesses but was unable to locate anyone. 3:45 PM – Officer responded to CVS Pharmacy for a report of a theft of 3 wooded pallets from the back of the building. 6:45 PM – Officer responded to H&R Block and conducted a building check that was thought to be left unsecured by an employee. The building was secure. 7:15 PM – Officer responded to Pumphouse Carwash for a report of a civil matter – child custody. 7:45 PM – Officer responded to HEB Plus for a report of a wanted person on the premises. A 19-year-old male subject was arrested for having an Active Warrant out of Bexar Co. for Unlawfully Carrying a Weapon – Handgun. Subject was transported to Atascosa Co. Jail. 6:53 AM – Officer responded to Star Cross Trail and discovered a lost potbellied pig roaming the streets. Officer located the owners who brought it home unharmed. 8:50 AM – Officer responded to Lytle-Somerset St. at Bruce St. and assisted Lytle Animal Control Officer with picking up a run over stop sign. Officer reported the sign down to Public Works. 12:05 PM – Officer responded to HEB C-Store for a report of solicitors. Upon arrival, officer located two males handing out pamphlets. HEB did not want them doing that there and they both agreed to leave. 10:18 AM – Officer responded to Wisdom Rd. for a report of a 911 text message coming from Wisdom Rd. Officer searched the area, unable to locate caller. 11:18 AM – Officer responded to IH 35 S Atascosa Co. for a report of an 18 wheeler side-swiping a passenger car. Officer located the vehicle outside city limits. TX DPS handled the accident investigation. 12:46 PM – Officer responded to HEB C-Store for a report of a 911 text to Atascosa Co. requesting an officer. Caller stated she had a bag of bones she suspected were of human origin, it was determined they were not human bones. The caller was the same 911 texter from the previous 911 text to Atascosa Co.
3:12 PM – Officer responded to Main St. (North end) for a report of a welfare check on an elderly female walking on the street. Officer searched a mile into Bexar Co. but was unable to locate. 4:40 PM – Officers responded to 100 Cielo Way to assist Atascosa Co. with a welfare check on a female staying at residence. Contact was made, all was fine. 4:42 PM – Officer responded to FM 463 at Lake Shore Dr. for a report of metal debris causing a traffic hazard. Officer arrived and removed debris. 5:47 PM – Citizen arrived at Lytle PD and turned in found property. Officer contacted the owner to pick up property. 7:19 PM – Officer responded to Beall’s for a report of a two vehicle crash. 7:43 PM – Officer released property to rightful owner. 10:03 PM – Officer responded to 19800 Blk. of Bruce St. to assist Atascosa EMS with a lift assist. 10:41 PM – Officer responded to 100 Blk. of Rock Dove Dr. to assist Atascosa Co. with unlocking a vehicle that had a child inside. 12:32 AM – Traffic stop at 15300 Blk. of Main St. resulted in the arrest of a 23-year-old male subject for having an Active Warrant for Probation Violation – Smuggling Aliens out of the US Marshals Office. Subject was transported to Atascosa Co. Jail. 10:22 AM – Officer responded to McDonald St. at Main St. to assist a motorist who had ran out of gas and was partly blocking the roadway. 11:32 AM – Officer responded to Somerset St. at Railroad St. for a report of a two vehicle crash. 1:30 PM – Officer responded to McDonald’s for a welfare check on a small dog inside a pickup with the windows rolled up. Caller agreed that it was cool and windy outside and officer explained he did not believe it was a safety issue for the dog since the temperature was rather cool. Officer responded over and the vehicle was gone. 5:14 PM – Atascosa Co. Sheriff Office advised officer to call and speak with a caller in reference to a welder theft. Officer spoke with the caller who stated he had followed the suspect to FM 463. Before officer could get an address the call was dropped. Officer tried calling the caller back but the phone went straight to voicemail. Officer patrolled the area, unable to locate anyone. 8:10 PM – Officers responded to IH 35 at Mile Marker 130 NB for a report of livestock on the road. Officers searched the area, unable to locate. 11:26 PM – Officer responded to 19700 Blk. of Bruce St. for a report of a subject locked out of the house. Officer advised subject to contact a locksmith. 11:54 PM – Officer responded to 14100 Blk. of FM 476 and assisted Atascosa Co. with a suicidal subject. 6:47 AM – Officers responded to 63200 Blk. of Hwy. 132 S for a report of an unresponsive male. A 41-year-old male subject was pronounced deceased by Medina Co. Justice of the Peace Glen Klaus. 9:57 AM – Officer responded to HEB C-Store for a report of a hit & run. 3:10 PM – Officer responded to McDonald’s for a report of a panic alarm that was triggered. The alarm was pushed by accident. 4:06 PM – Officer responded to FM 3175 at Pinn Rd. to assist Atascosa Co. with loose livestock. 9:41 PM – Officer responded to 19700 Blk. of Creek St. and talked to complainant in reference to her missing keys to her vehicle.